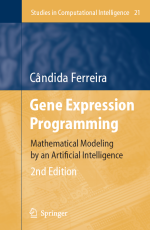 Read more about the 2nd edition of the first book on Gene Expression Programming by its inventor. What is Gene Expression Programming? Gene Expression Programming (GEP) is an evolutionary algorithm that automatically creates computer programs. These computer programs can take many forms: they can be conventional mathematical models, neural networks, decision trees, sophisticated nonlinear regression models, logistic regression models, nonlinear classifiers, complex polynomial structures, logic circuits and expressions, and so on. But irrespective of their complexity, all GEP programs are encoded in very simple linear structures – the chromosomes. These simple linear chromosomes are a breakthrough because, no matter what, they always encode valid computer programs. So we can mutate them and then select the best ones to reproduce and then create better programs and so on, endlessly. This is, of course, one of the prerequisites for having a system evolving efficiently, searching for better and better solutions for all kinds of problems. If you want to know how simple linear chromosomes can be used to automatically generate complex computer programs, see the 2001 Complex Systems paper Gene Expression Programming: A New Adaptive Algorithm for Solving Problems, which is freely available online. Or you can read a shorter online tutorial for a quick introduction to Gene Expression Programming. Other online tutorials are also available for faster and more informal expositions. For more advanced topics, all my GEP papers are freely available online both in pdf format and html. The 1st edition of the GEP book is also freely available online, but you should also check the 2nd Springer edition which was substantially revised and extended with 5 new chapters, including a chapter describing 2 new algorithms for decision tree induction with GEP. Subscribe to the GEP mailing list.